Rousseau’s concern about the corruption of virtue in the Discourse on the Sciences and Arts is a theme that would run through the rest of his principal works, and would come to be articulated as a key part of his moral psychology. Rousseau claimed that human beings are possessed of two types of “self-love.” The first, amour de soi, is simply the interest we take in our own survival and comfort. The second, amour-propre, is inherently relational. That is, it is a kind of value we place on ourselves on the basis of receiving recognition from others. To understand amour-propre, one must know a bit about Rousseau’s conception of human nature. Following philosophers in the century before him such as Thomas Hobbes and John Locke, Rousseau conceived of human beings in a state of nature. That is, he imagined human beings stripped of all those characteristics that they could only have acquired by the conventions of human society. Human beings in the state of nature are primitive, pre-social, isolated, do not exercise complex reasoning, and act largely from instinct. Amour-propre is undeveloped in this state. Only when human beings begin to form social relationships with one another will they begin to take notice of what others think of them. In the earliest human societies, those marked by small groups of families, amour-propre becomes part of the human experience. However, it is relatively benign, and Rousseau called this era the happiest in human history. Portrait of Jean-Jacques Rousseau circa 1753, by Maurice Quentin de La Tour. Musée Antoine-Lécuyer, Public Domain via Wikimedia Commons. As civilization develops, he claimed that amour-propre becomes inflamed, and we end up with a society marked by gross and unjust inequality, a lack of genuine compassion for others, and the kind of superficial set of values that Rousseau rails against in the Discourse on the Sciences and Arts. In short, humans become driven by a desire for recognition and approval regardless of whether or not that recognition is due to something that is truly worthy of respect. At its worst, people think nothing of tearing others down so that they might feel superior themselves. Rousseau was deeply concerned with the dangers inflamed amour-propre produces and the question of how we might overcome them. He gave one short answer in his comprehensive work on moral education, the Emile. One of his claims was that people in large cosmopolitan settings such as eighteenth century Paris are particularly susceptible to the worst vices of amour-propre. Rousseau clearly thinks it much more likely that virtue will better flourish in rural communities. Rousseau likely believed this at least in part because these less urban environments more closely resemble the earlier times in human history mentioned above in which we lived closer to nature. These Rousseauian ideas, I believe, provide an interesting lens through which to view features of our own society. Specifically, I am thinking about the way that an increasingly online world connects human beings to one another in a way that not too long ago would have been difficult to even conceive. If Rousseau was wary of amour-propre’s dangers in more populated areas like the Paris of his time, what would he think of forums like Facebook and Twitter? Indeed, I think the Academy of Dijon’s question about the sciences and arts is poignant for us with respect to the age of the internet and social media. Has this tended to purify morals? One might say no. This connectedness has resulted in new forms of what Rousseau would undoubtedly describe as inflamed amour-propre. We post pictures of ourselves, various thoughts we have, descriptions of various events that anger us, all the while looking to see how many “likes” we get. Trolling is common in online forums, with people not hesitating to say vicious things online that they would likely never say to someone’s face. Cyber bullying has become an all too common. We also observe the phenomena of people constructing online profiles in the hope of getting recognition and praise, even if the profile does not really resemble whom he or she really is. I think Rousseau would claim that all of this comes at the expense of virtue. So, on the whole, are we better, worse, or unchanged for all of the technological advances that allow for this new interconnectedness? And if we are worse, is there hope for us to make changes? Rousseau himself became increasingly pessimistic about curing the ills of amour-propre. He ultimately retreated from society altogether, in sense returning to nature. I am less pessimistic, but I think Rousseau raised important cautions for his contemporaries that are still very much worth thinking about for us even more than 300-years later. Featured Image credit: Statue of Rousseau, Public Domain via Wikimedia Commons. James Delaney is Professor of Philosophy at Niagara University. Delaney’s work focuses on normative ethics and the history of philosophy. 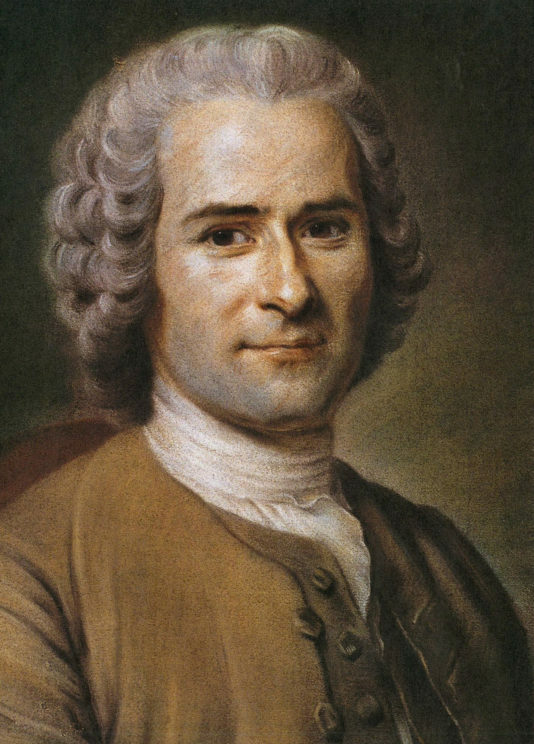 He is the author of the Oxford Bibliographies in Philosophy article “Jean-Jacques Rousseau”.